As a family, cats are some of the most well-studied animals on Earth, but that doesn’t mean these adept carnivores don’t continue to surprise us. Scientists have announced today the stunning discovery of a new species of cat, long-confused with another. Looking at the molecular data of small cats in Brazil, researchers found that the tigrina—also known as the oncilla in Central America—is actually two separate species. The new species has been dubbed Leopardus guttulus and is found in the Atlantic Forest of southern Brazil, while the other Leopardus tigrinus is found in the cerrado and Caatinga ecosystems in northeastern Brazil. Eizirik says the initial data shows that these two species of tigrina have been separated by at least 100,000 years. Tigrinas are about the size of a house cat and prey on small mammals, lizards, eggs, and birds, largely at night. Despite being a charismatic predator, little is known about these cats though they are closely related to the better-known and larger ocelots and margays. Tigrinas are actually found as far north as Costa Rica and as far west as Peru and Ecuador, but the scientists aren’t sure yet how these other populations fit into the two Brazilian species. 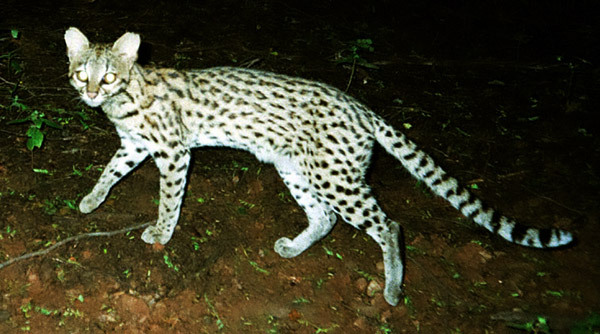 Currently, the tigrinas of Central America, known as oncillas locally, are considered a distinct subspecies, Leopardus tigrinus oncilla, but not a full species. “We have published some data on mtDNA sequences from tigrinas from Central America, and they were quite distinct, suggesting that they could represent an additional species. But mtDNA differentiation is not enough to warrant species-level differentiation, so our current focus is to perform thorough analyses (such as the ones we now report for the Brazilian populations) for the whole complex, which we hope to accomplish soon,” Eizirik says. Of the two Brazilian species, the Leopardus tigrinus of northeastern Brazil is currently “virtually unknown,” with more research desperately needed for this elusive feline, according to Eizirik. The tigrina is currently listed as Vulnerable by the IUCN Red List, while the Central American subspecies is considered Endangered. However, Eizirik notes that the discovery of two species (at least), instead of one could change the threat level for these cats. “If anything the range of each species will be smaller than their joint geographic distribution, so that in itself should prompt a reassessment of each of them,” he says. Both Leopardus tigrinus and Leopardus guttulus are likely imperiled by habitat loss and degradation. The Atlantic Forest, where Leopardus guttulus prowls, is one of the world’s most degraded rainforests with only about 7 percent remaining, and much of this in small fragments. Meanwhile, over half of the cerrado savanna—the home of the Leopardus guttulus—has been lost to cattle and soy farms in just a few decades. Although, it’s plight is lesser-known than the Amazon’s, the cerrado is disappearing at twice the rate with experts warning it could be gone by 2030. The adjacent Caatinga ecosystem is a dry, tropical forest and is also under pressure by big agriculture in Brazil as well as climate change. Leopardus tigrinus is found in the cerrado and Caatinga regions of Brazil and is actually the lesser-known of the two tigrinas. Photo by: Projeto Gatos do Mato – Brasil/Project Wild Cats of Brazil. While the two tigrina species don’t interbreed,Leopardus guttulus is also threatened by hybridization with another small wild feline in the region, Geoffrey’s cat (Leopardus geoffroyi). Although it took DNA research to discover that there is more than one tigrina roaming Brazil, the possibility had been raised by researchers in the past. The discovery of a new cat species using DNA is not unheard of: in 2006, scientists announced a new species of clouded leopard, the Sunda clouded leopard, based on DNA evidence and the animal’s coat patterns. If accepted by the wider scientific community, Leopardus guttulus will be the 41st species of cat in the world. But given the increasing use of DNA evidence to determine species, it’s likely there are even more hidden cats out there. Trigo et al. Molecular data reveal complex hybridization and a cryptic species of Neotropical wild cat. Current Biology. 2013. (11/26/2013) Good news today about one of the world’s rarest mammals today: camera traps in China’s Wangqing Nature Reserve have captured the first proof of breeding Amur leopards in the country, according to the Wildlife Conservation Society (WCS). The photos show a mother Amur leopard with two cubs. A recent survey by WWF-Russia estimated the total wild population of Amur leopards at just 50 individuals, but that’s a population on the rise (from a possible nadir of 25) and expanding into long-unused territory. (11/11/2013) On October 22nd Bangladeshi and Indian officials were supposed to hold a ceremony laying the foundation stone for the Rampal power plant, a massive new coal-fired plant that will sit on the edge of the Sundarbans, the world’s largest mangrove forest. However, the governments suddenly cancelled the ceremony, instead announcing that the project had already been inaugurated in early October by the countries’ heads of state via a less-ornate Skype call. While the governments say the change was made because of busy schedules, activists contend the sudden scuttling of the ceremony was more likely due to rising pressure against the coal plant, including a five-day march in September that attracted thousands. Could camera trap videos galvanize the world to protect Yasuni from oil drilling? (11/07/2013) Even ten years ago it would have been impossible to imagine: clear-as-day footage of a jaguar plodding through the impenetrable Amazon, or a bicolored-spined porcupine balancing on a branch, or a troop of spider monkeys feeding at a clay lick, or a band of little coatis racing one-by-one from the dense foliage. These are things that even researchers who have spent a lifetime in the Amazon may never see. Now anyone can: scientists at the Tiputini Biodiversity Station in Ecuador’s Yasuní National Park have recently begun using camera trap videos to take movies of animals few will ever view in their lifetimes. The videos—following years of photo camera trapping—provide an intimate view of a world increasingly threatened by the oil industry. (11/06/2013) The Wildlife Conservation Society’s Central Park Zoo is debuting a pair of snow leopard cubs that were born this past summer. (11/04/2013) The bay cat is arguably the world’s least-known member of the cat family (Felidae). Although first described by scientists in 1874, no photo existed of a living specimen until 1998 and a wild cat in its rainforest habitat wasn’t photographed until five years later. Given this, scientists with Zoological Society of London (ZSL) and Imperial College London were taken aback when their remote camera traps captured numerous photos of these elusive cats hanging out in a commercial logging concession in Sabah, a state in Malaysian Borneo. (09/30/2013) A camera trap survey along the Sikre River in Honduras has discovered that the region is home to a menagerie of rare mammals, including giant anteaters. 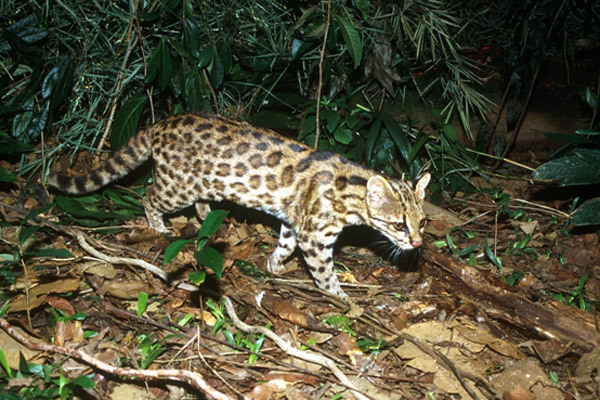 The survey, published in mongabay.com’s open access journal, Tropical Conservation Science, recorded five cat species in 70 square kilometers. (09/30/2013) In 2009 conservationists estimated that less than 2,000 lions survive in Kenya, a drop of 26 percent in just seven years. In addition, the East Africa country continues to hemorrhage lions: around a hundred a year. Poaching, poisoning, and large-scale habitat loss has put lions on the defensive across Africa, but even countries once thought lion strongholds–like Kenya–have seen populations harried to devastation and in some cases local extinction. Shivani Bhalla, a fourth-generation Kenyan, is working to turnaround this trend in Samburu National Reserve. (09/17/2013) Everyone knows that tigers, pandas, and blue whales are threatened with extinction—but lions!? Researchers were shocked to recently discover that lion populations have fallen precipitously: down to around 30,000 animals across the African continent. While 30,000 may sound like a lot, this is a nearly 70 percent decline since 1960. In addition, lion populations are increasingly fragmented with a number of populations having vanished altogether. However, there is hope: one place where lion populations are actually on the rise is Niassa National Reserve in Mozambique. Here, lion populations have risen by around 60 percent in just seven years. In part this is due to the effort of Colleen and Keith Begg. (09/10/2013) The Serengeti, the Congo, the Okavango Delta: many of Africa’s great wildernesses are household names, however on a continent that never fails to surprise remain vast wild lands practically unknown to the global public. One of these is the Ruaha landscape: covering 51,800 square kilometers (20,000 square miles) of southern Tanzania’s woodlands and savannah, Ruaha contains the largest population of elephants in East Africa, over 500 bird species, and a wealth of iconic top predators, including cheetah, hyena, wild dogs, leopard, and—the jewel in its crown—10 percent of the world’s lions. 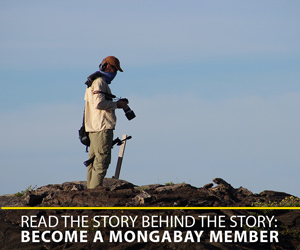 But that’s not all, one of Africa’s least-known and secretive tribal groups, the Barabaig, also calls Ruaha home.